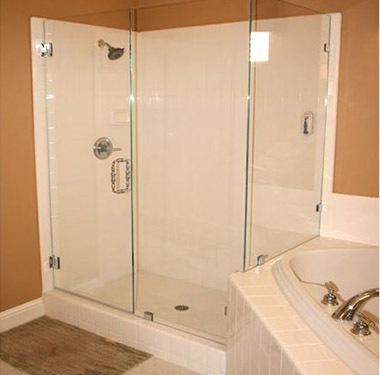 Enhance the look and feel of your bathroom with a glass shower enclosure. Nothing is quite as elegant and inviting as glass. Let us take the guess work out of your remodeling project with a customized solution tailored to you. We have a wide range of options and enhancements available. We pride ourselves on creating custom solutions that fit within your budget. 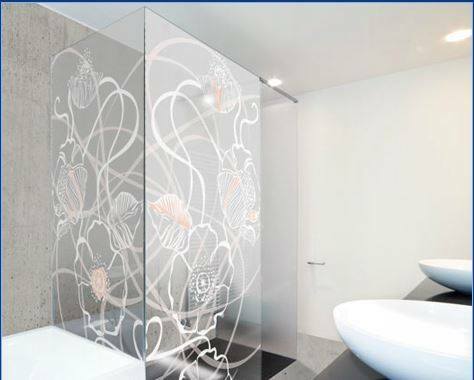 Contact us now to find how we can help you transform your bathroom into a work of art. A simple upgrade that instantly adds luxury to your bathroom. The rich beauty of architectural glass provides for a variety of unique shower designs. Designs that can play with light flow and dramatically add elegance. 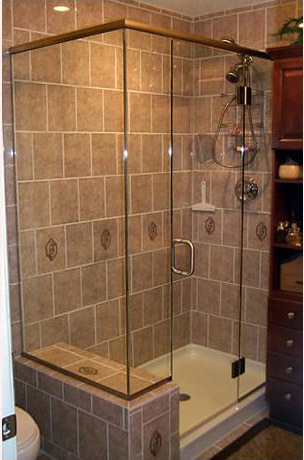 Highlight your décor to the fullest with a frameless shower enclosure installed by American Glass and Window LLC. Most Neo Angle enclosures require a header for safety / security reasons. Frameless enclosure with door attached to fixed panel, u-channel, and a header. A header is usually required for security/ support reason when attaching the door to a fixed panel. Note the door is attached by hinges. Clips are used on the fixed panels. 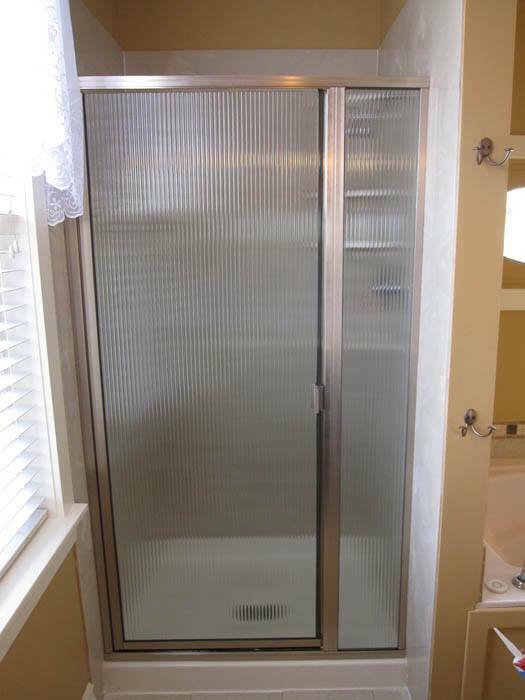 A Semi Frameless shower enclosure also has metal around the entire structure, but does not have metal around the entire door. Thus the term semi frameless. Note the metal around the door is only on bottom to control drip. 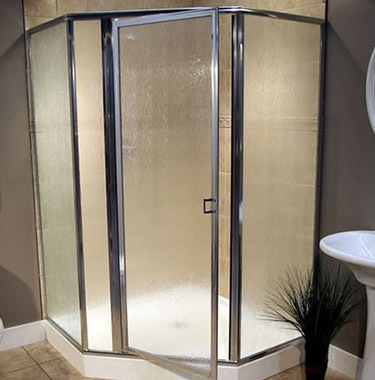 A framed shower enclosure is pretty simple to define. It has metal around the entire structure. Including the door. Note the metal around the door. 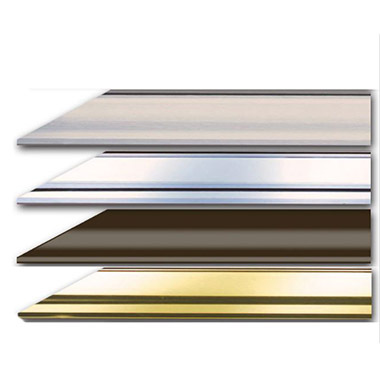 Hardware is available in Chrome, Brushed Nickel, Oil Rubbed Bronze and Polished Brass. Custom colors are also available. 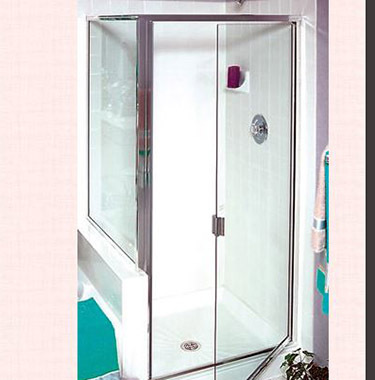 Framed glass shower doors offer increased privacy, are versatile and more cost effective. 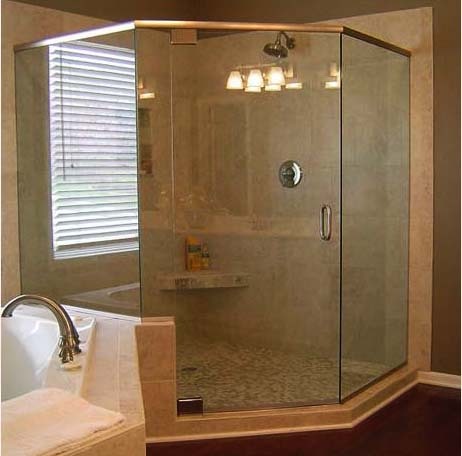 Depending on the layout, budget, and your desires, a framed shower enclosure may be the perfect fit. These doors a do a lot more than just keep the water and steam inside. They add a touch of glass to your bathroom. Make a statement with frosted, satin or textured glass. Our custom glass options are almost limitless. Add lure and luster while protecting your privacy. Or, transform your glass into a work of art. You’re only limited to your imagination. Our professional Glaziers have installed everything from steam rooms to arched entries and even sky light showers. Contact us today and let we’ll take the guess work out of your remodeling project.